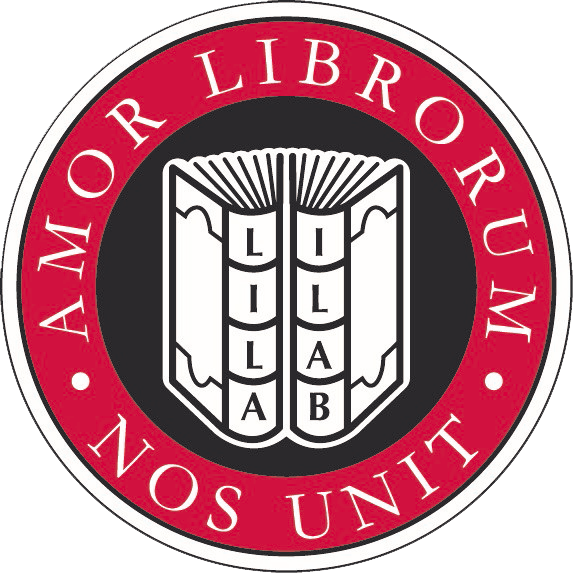 Hexenspiel. (The Witch game). 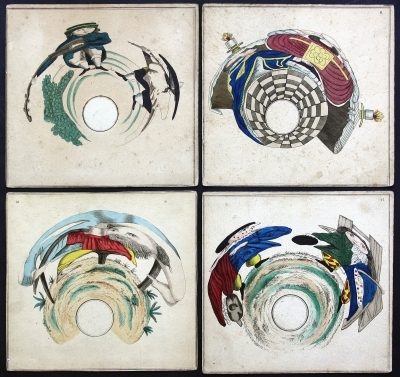 (Munich)?, circa 1750/1760. (probably Franz Xaver or Franz Joseph Fetscher). 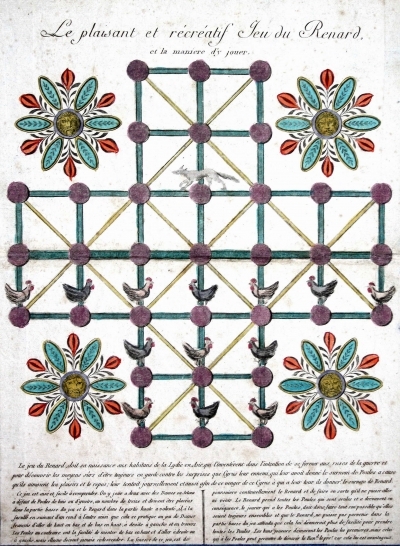 The Witch game (or Bird game) is a traditional game that is played with either cards or wooden pieces. It has no suits nor special trumps but nevertheless ranks are very important. 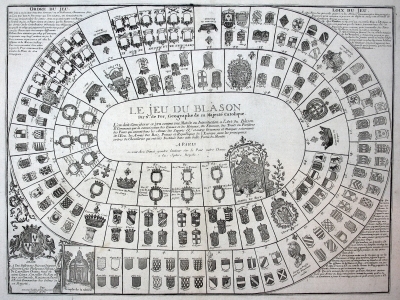 It was widely played in Europe under different names and has its origin in 15th-century France. It’s similar to the Italian Cuccu, the Norvegian Gnav or the Swedish Kille. 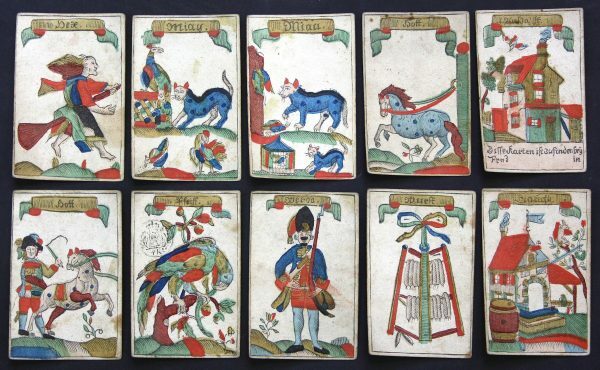 In Germany the first card decks appeared in the midst of the 18th-century. 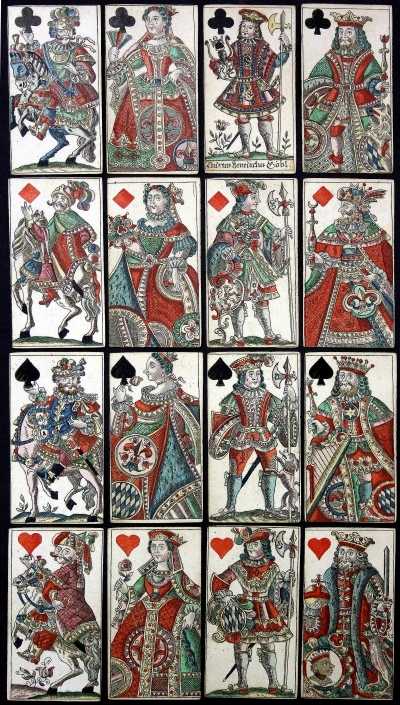 Our deck comprises 32 cards with 10 pairs of non-identical picture cards and 12 numeral cards. 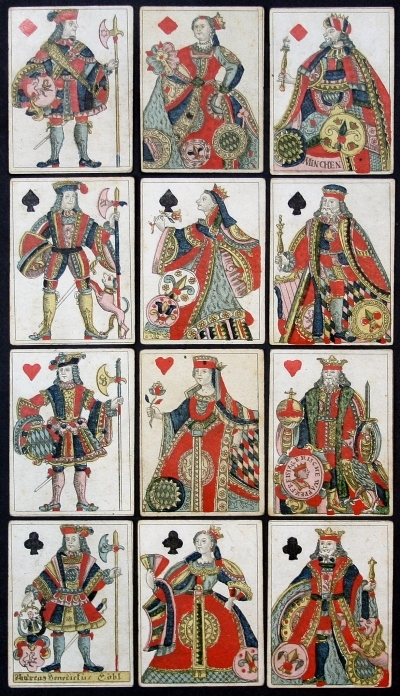 It can be dated to circa 1750/1760, according to the contemporary uniforms of the Grenadiers on the soldier cards. 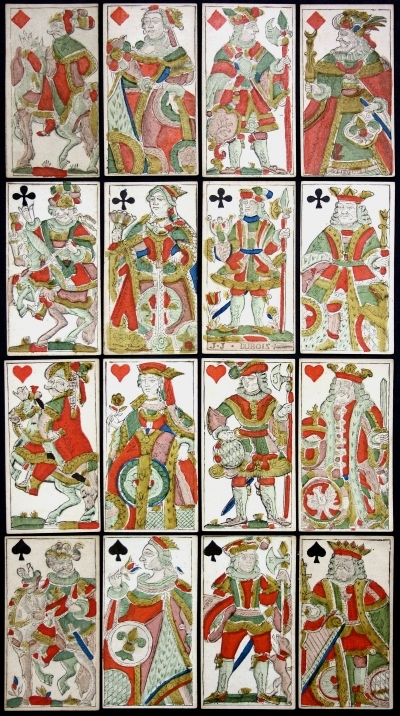 The cards have substantial similarities to a deck of Franz Xaver Fetscher from Munich which was published around 1750/1760 (Radau/Himmelheber, 233). 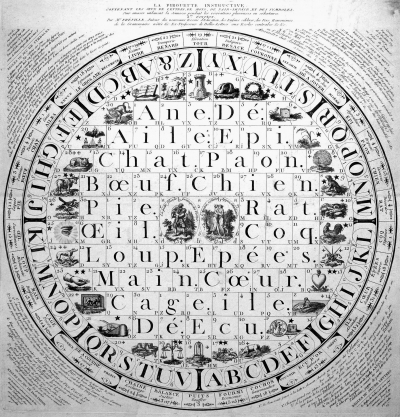 The name of the cardmaker has been cut out from the original woodblock. The „Auszallt“-card bears the writing „Disse Karten ist zu finden bey Fra()z (…) in“. „Fra()z“ most probably is the rest of the name Franz, and therefore could stand for either Franz Xaver or Franz Joseph Fetscher in Munich. 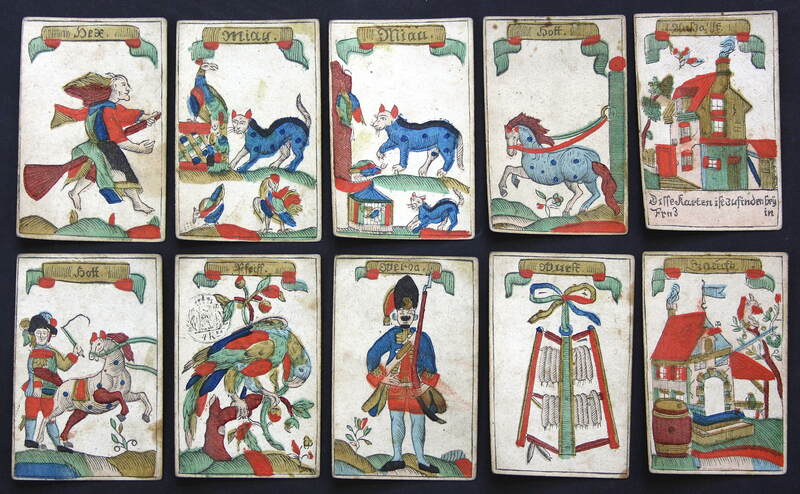 The Fetschers were a cardmaker family in Munich from the 17th to the end of the 19th century. 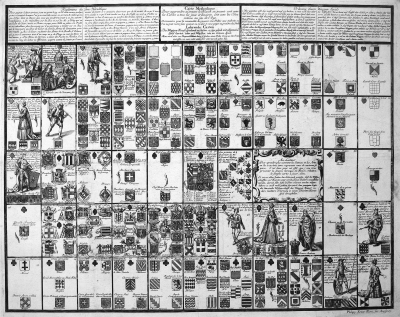 There are a few Witch games by the Fetscher family known, all dating back to the 18th century. 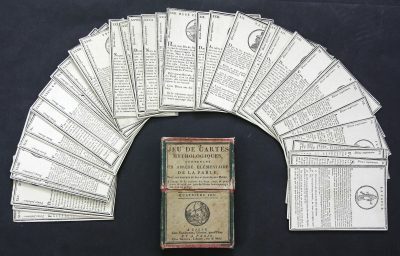 Tax stamps can be useful for dating playing cards, but sometimes the card decks were sold years after they were printed. Our deck must have remained several decades in the Fetscher family property since it was sold. 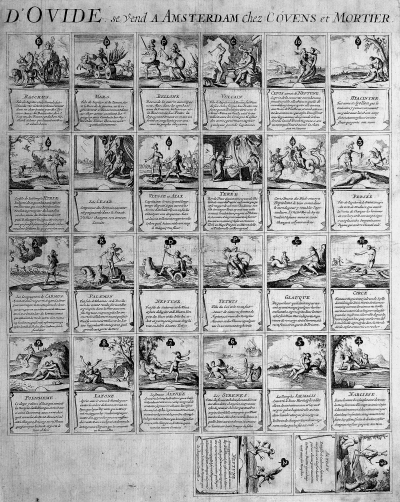 The manipulated woodblock can also be an indication for the sale of the woodblocks to another cardmaker, which was not an unusual practice between cardmakers. 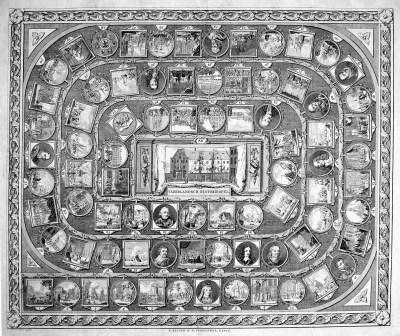 German Witch games are very rare. 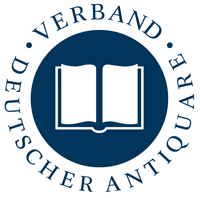 They never became widespread in Germany and even a century after their first appearance have been disappeared from the market. 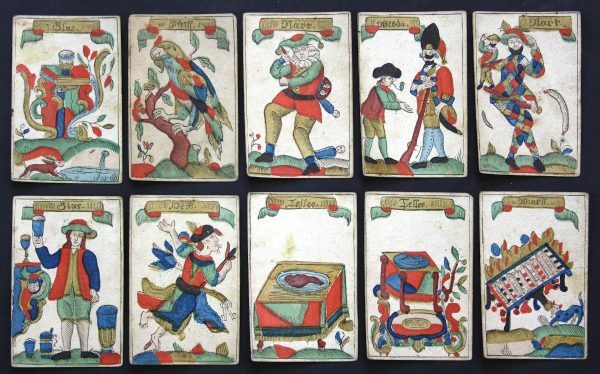 Our deck is one of the earliest known german Witch games. 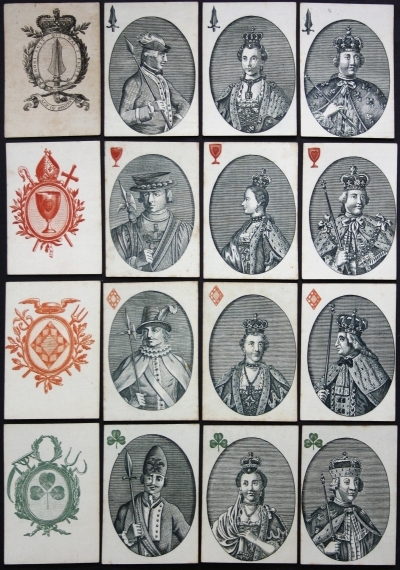 Like most playing cards from the 18th-century it is exceptionally rare.